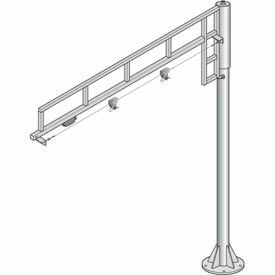 Jib Boom Kits May Be Bench Or Floor Mounted For Use With Workbenches In A Variety Of Industrial Environments. Jib Boom Kits hold up to 30 lbs. Kits may be bench or floor mounted to suit individual needs. Available with Swing Boom or Fixed Boom. Beams are available in lengths of 4' or 7'. Fasteners for mounting base to bench top or floor not included. Heavy Duty Jib Kits Provide Reliable Stability For Cranes, Booms And More. 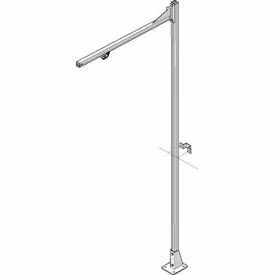 Heavy Duty Jib Kits come with 1 boom and 1 vertical beam with integral mounting base. Booms may be adjusted higher or lower on the beam to suit specific application needs. All kits include hardware needed for assembly. Booms on 150 or 300 lb. capacity kits are mounted to top of beams with tapered bearing and heavy-duty rollers allowing a full 360° swing. Kits are available with Swing Boom, Fixed Boom, Pneumatic, or Electric. Trolleys, Lock Kits and Rotation Stops are sold separately.